It was not too long ago that Lesvos was a pretty red island: communist, due to the large number of poor people, mostly farmers.Today its population is no longer that poor and elections show that the revolutionary spirit has softened somewhat. Communism is against religion. Everybody knows what Marx once said: “Religion is opium for the people”. That is why you might wonder about the Lesvorians who clearly have not taken this message onboard: if you count all churches and little chapels on the island, I am sure that there are more churches and little chapels than there are inhabitants on Lesvos. They are all deep into the orthodox religion and each year they celebrate the nameday of the saints to whom those churches and chapels are dedicated. So, nearly each day, somewhere, you can find a festivity. The biggest party is thrown on August 15th, the day that Mary flew to heaven. After Easter, it is the biggest religious festivity of Greece. In tourist areas August 15th is the busiest day of summer. Most people in the cities, with family living on an island or at the seaside have packed their bags for these cooler areas. The quiet villages on the islands now are bursting with lively big families. The houses where in winter normally only granddad and grandmother live, are now filled with a collection of different generations of Greeks, who loudly talk, laugh, scream and celebrate. On the Ascension of Mary everyone goes to church. Most of them dressed to the nines, women staggering on towering high heels. Some go to the Mary churches to show penitence or ask Mary for a gift. The custom for this group is to walk long stretches to the church, the last hundred meters or so on their knees. I can imagine that the ladies doing this, remove their high heels. The Lourdes of Greece is on the island of Tinos, where pilgrims on their knees or even creeping on their bellies enter the holy inner space of the Panagía Evangelístria. This church is built around an icon of Mary, purportedly painted by the apostle Lucas. In 1822 Mary revealed to a fifteen year old nun where this icon was buried and since then thousands of pilgrims visit this small island. Lesvos also has its share of religious tourists. The Panagia churches in Agiasos and Petra are high on the international list of holy Mary-places of Greece. I always have troubles dealing with Greek names: they all are named Yorgos, Yannis, Yanoula, Despina or something. However, for the thousands of Mary Churches they have a solution. In Petra you have the Mary of the Sweet Kiss (Panagía Glikofiloussa), in Agiasos the Mary with the Holy Child (Panagía Vrefokratoussa) and in Skala Sykaminia the Mermaid Mary (Panagía Gorgonas). On the south coast, not far from Melinda, there is a little church dedicated to the Hidden Mary: Panagía Krifti. When the Ottomans still ruled over the island a young woman with child was persued by some Turks, right down to the sea. Lost between high rocks, she did not know where to go. She then prayed to God and he was friendly enough to show her a hidden cave that saved her. Later the cave was dedicated to Mary and off course, a little church was build at the spot. In 1922 lots of refugees from Asia Minor arrived at the place and they all took the Hidden Mary as their patron saint. In the Second World War it was people of the resistance who turned towards the Mary Krifti. But it was not the Hidden-Mary-at-Sea. 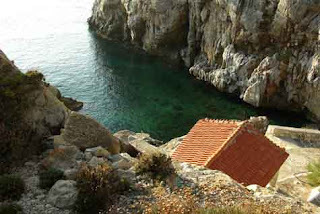 High in the mountains, in the extended pinewoods above Parakila there is another Panagia Krifti-church hidden in a cave. That place I think was more suitable for resistance heroes, because this place really is difficult to access. The Maria-Krifti-at-Sea is easy to reach by sea, but the Hidden-Mary-in-the-Woods can only be found with a guide. Hidden or not, civilian or god, after tomorrow all Mary’s will be celebrated, and in Greece they have a lot of them. That is why on August 15th, all Greeks, even the communists, will have a party.